Discussion in 'Henshin Justice Unlimited' started by SamuraiEchidna, Feb 8, 2019. Welcome to the discussion thread for Kamen Rider Zi-O, episode 21; "Mirror World 2019". This week: Sougo and Geiz face a new Another Rider who can return all attacks against it with two times the power and their investigation on the enemy leads them to meet Daisuke Okubo, chief editor of the ORE Journal. I'm surprised no one is commenting on this! Not only did they recreate that mirror-well from Ryuki's opening sequence, but they also went back to that original apartment from the start of the Ryuki series! It's been a while; I can't remember the finale for Ryuki very well, but I want to say Shinji died in the finale. So how will they explain him coming back? They don't for now. But we all know that Zi-O's existence is changing the past of previous Riders. Which means he never became Ryuki and never sacrificed himself in the first place. Same reason why Kaixa was alive in the Fourze/Faiz episodes. But a corrupt reflection of Sougo might explain how he went evil in the first place. And I see White Woz isn't doing the opening this time. Did they reverse the order? We'll see in part 2. That's not what happened in the Ryuki finale though. 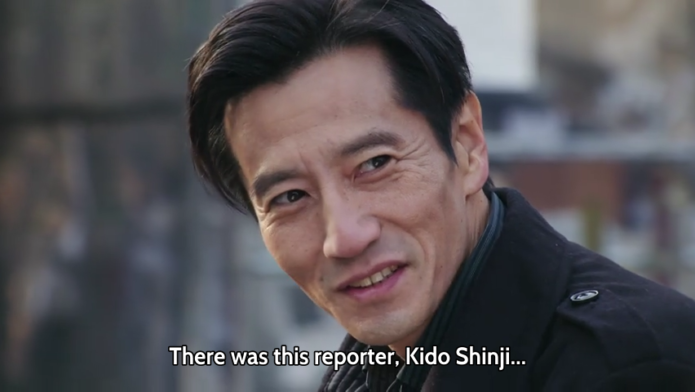 Shinji Every crossover has been ignoring Ryuki finale forever with a few making allusions to using Episode Final version of Ryuki events, but not stating anything specific. Dunno why spoiler tag doesn't work and I seemed to be unable to edit my post to fix it. I didn't see that one too long ago. As far as I could tell, it looked like Knight was going to get the final wish, so Odin flipped out & reversed time so it would start all over again, pretty much saying that he would keep doing so, no matter what his sister wanted, until he got his wish to save her. My best guess, then, is that eventually there was a universe where making Riders was not necessary & Shinji never became one anyway. Either that, or Shinji & co won or, just like with several others, making the Another Rider just wiped his memory. Then, I suppose it gets even more complicated & confusing when you try to contemplate however Decade must have messed with that universe over the years. I guess we shouldn't try to think about it too hard, lol. As to the actual episode, I kind of liked it & am looking forward to seeing how it ends, now that 22 is up. It was kind of refreshing to see another older character show up after a solid month of making new stuff up. Despite that, though, I am curious to see what that alleged third future rider White Woz brought up is going to be. I'm guessing the events of Zi-O do not apply in the mirror world, thus allowing Dark Shinji to roam about. I can see this Ryuki tribute episode to be a fourth timeline to the events of Ryuki. We have the tv series, episode final, Decade and now Zi-O's. That will prevent any sort of confusion. Not sure why people keep calling Decade a timeline. Because it's not. Decade was about exploring the multiverse. Different universes, different realities, different rules. Even Decade's opening confirmed this by saying, in English, "Parallel world". With a few key exceptions here and there (including the movies), nearly every Rider that Decade met was a non-canon version of that Rider. Decade's Ryuki is not the same Ryuki from the 2003 TV show. Zi-O is time traveling and altering the histories of the canon Riders from previous TV shows. I know it's a little confusing, but they explained this in the first few episodes.